Tag Archives for " Mike McLaughlin "
Is Social Media Changing Selling? Social media has certainly changed marketing, but few people are addressing just how dramatically it’s changed sales. In this interview we hit that subject pretty head on. My guest for this episode of the Duct Tape Marketing podcast is Mike McLaughlin. 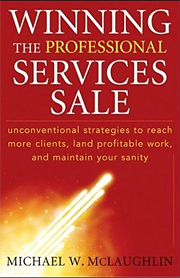 He’s the author of Winning the Professional Services Sale, which offers professional service providers, business development managers, and firm leaders new strategies to identify, qualify, and close any services sale. McLaughlin is also the coauthor of Guerrilla Marketing for Consultants, the first book to apply the principles of Guerrilla Marketing to the business of consulting and professional services.